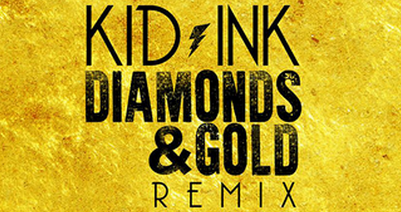 Yesterday Kid Ink released the remix to Full Speed cut “Diamonds & Gold”. This time around, the L.A. rapper teamed up with frequent collaborator Chris Brown, French Montana and R&B singer Verse Simmonds. “Diamonds & Gold” is an upbeat track about living a rich and lavish lifestyle. While Chris Brown handles the chorus, Kid Ink, French Montana and Verse Simmonds deliver a few verses of their own. “Baby it’s nothin’, if you need something! Know I’m good for it, I can put that on everything! I put it up, cause baby keep frontin, you could have it all right now! You know I’m good for it, I put you in diamonds & gold,” Breezy croons over the David D.A. Doman-production. Currently Kid Ink is preparing for his first child with fiancée Asiah Azante and launching a European tour! Check out Kid Ink’s “Diamonds & Gold” featuring Chris Brown, French Montana & Verse Simmonds below!